Blank check on top with one long voucher. CopyBan Capture® patented background with a hidden VOID. Blank check on the bottom with one long top voucher. CopyBan Capture® patented background with a hidden VOID. Blank check on the top with two stubs. CopyBan Capture® patented background with a hidden VOID. Multipurpose check on bottom with long voucher for check related details. 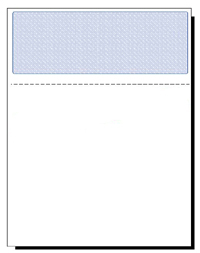 Multipurpose check on top with long voucher for check related details. Perforated at 3 1/2" and 7" for easier folding. Payroll check on top with two stubs for check details. Perforated at 3 1/2" and 7".